According to the Federal Highway Administration (FHWA), West Virginia has one of the highest run-off-the-road crash frequencies in the nation. The state's challenging terrain and sharply curved roadways are likely contributing factors. Additional data from the FHWA indicates that 74 percent of all fatal crashes in West Virginia from 2011-2015 were roadway departure crashes. 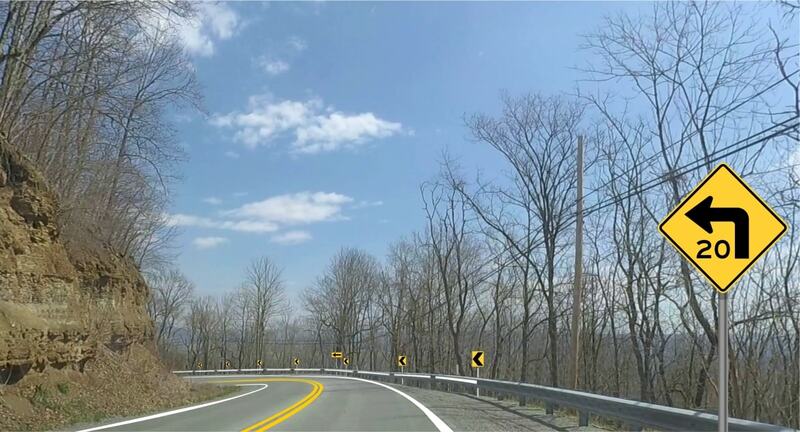 To reduce these crashes, the FHWA initiated a roadway departure study in West Virginia. B&N worked with the West Virginia Department of Transportation’s Division of Highways (WVDOH) to evaluate 260 miles of U.S. and State routes with the highest occurrence of run-off-the-road crashes and identify potential low-cost solutions. To collect the most accurate data and determine the curve advisory speeds, B&N leveraged Curve Advisory Reporting Service (CARSTM) software. Nearly 3,000 miles were driven and over 1,000 curves were assessed, and the findings revealed that most of the curves had advisory speed postings that were incorrect or outdated. As a result, over 8,500 new signs were recommended. In addition to determining the advisory speeds, B&N identified cost-effective practical design improvements including an automated spreadsheet for advisory speeds and maps for signage that have the potential to reduce run-off-the-road collisions. Lastly, contract documents were developed to address systematic and spot improvements and allow projects to move directly into construction.